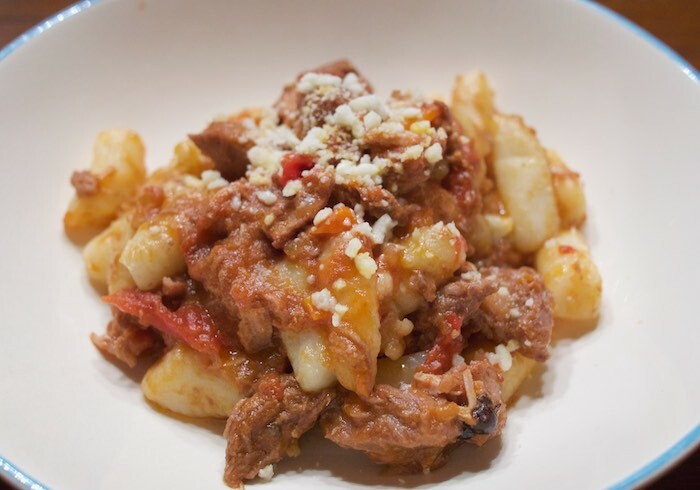 Nothing reminds me of our time in Tuscany more than a hearty bowl of wild boar ragu, served over homemade gnocchi. Wild boar, or Cinghiale as it's called in Italian, is a gamey tasting meat that when slow cooked with tomatoes makes a rich hearty sugo. Paired with gnocchi this is one of my all-time favorite dishes and something we ate often in Italy. I recently received wild boar stew meat from D'Artagnan Foods and couldn't resist making a ragu. One bite and I was instantly transported to the hills of Tuscany and reminded how much I love and miss Italy. In a bowl, combine the wild boar, wine, juniper berries, bay leaves and sage. Marinate the boar in a cool place for 6-12 hours. Drain the meat and pat it dry with paper towels. Strain the marinade, reserving the liquid, set aside. In a casserole over moderate heat, warm the olive oil. Add the meat and cook until browned on all sides, about 10 minutes. Add the onion, carrot and celery, stirring over low heat for 2 minutes. Add the tomatoes and continue cooking over low heat for about 50 minutes. When the liquid from the tomatoes has evaporated add 1 cup of the marinade liquid. Cook the boar for about 3 hours, gradually adding the remaining marinade so that the sauce never sticks to the pan. When the sauce is ready, season to taste with salt and pepper. Remove the boar and shred. Serve with homemade gnocchi. I've never tried wild boar. This looks amazing! What a fun recipe! Nothing beats the food in Italy! Love this! Gnocchi has always been my ultimate comfort food! Gnocchi ragu is my husband's favorite ragu. The wild boar is a nice, exotic twist. Wow this looks fancy. Not sure where to find boar but I'll keep an eye out. I haven't had wild boar before, but love the way you describe this dish and the flavor of the meat. Also, anything with gnocchi is fabulous in my book. I bet the red wine and tomatoes cuts back on the game-i-ness perfectly... and if all else fails, MORE WINE!! Wow, what a flavor combination! Bet this tastes absolutely amazing! Never had boar before but I might just have to try it! This sounds like an amazing Italian-inspired meal! I adore gnocchi so I know I'd love this :) Thanks for a great recipe! I really like the use of the boar. Adds such a good flavor. I am spending the month of June in Tuscany to celebrate my big 6-0. We love Italy and have cycled almost everywhere except Tuscany. I'll be on the look out for this boar dish when I'm there. And the gnocchi sounds like the perfect platform for it. I've heard that boar is very popular there, I must try it. How interesting using wild boar in the ragu. I would love to give it a try. I have never tried boar but it certainly does look like it would be delicious cooked in a ragu. Thank you for sharing with us! My dad hunted when I was young so we got to try lots of interesting meat and fish too. I've tried wild boar, it's pretty darn good. Love this ragu, I bet the flavour is off the charts. I've never had boar so will have to do a substitute of something. Looks great. I am intrigued as to how it tastes but it sure looks delicious! I don't think I've ever had wild boar before, does it taste strong? More like beef or? Very interesting recipe with wild boar! Looks delicious!